The beaches of North Carolina’s Crystal Coast provide an exotic backdrop for romantic beach weddings. Unlike tropical island resorts staying state-side is affordable and relatively hassle free. Travel to the coast is simpler and less costly for wedding couple and their guests… and you won’t even need to bring a passport! 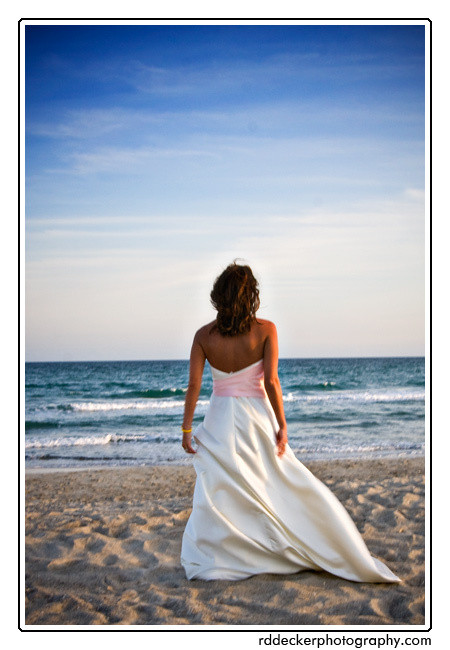 The months of April through October are traditionally favorites with beach brides. However, winter months are frequently quite comfortable as well. Regardless of time or year or location, when planning an outdoor wedding it’s always best to have a back-up plan in case Mother Nature decides not to cooperate. This package is only available Monday through Friday and is perfect for intimate beach weddings and elopements. You get 2 hours of wedding day coverage, (enough for the ceremony and portraits), a disk of your images with a printing release and a 20 page 8×8 Coffee Table album (one image per page) plus an online proofing gallery for only $950. Four hours of coverage provides enough time to include some getting ready and reception coverage. You’ll receive a disk of your images with printing release, a 20 page Coffee Table album (one image per page) and online proofing gallery for $1250. A more comprehensive package you’ll receive 6 hours of wedding day coverage plus a disk of your images with printing release, a 24 page custom designed Coffee Table album and online proofing. The cost for this package is $2000.